The improved output temperature coefficient leads to the almost halving of the decline in power generation efficiency during hot summer. Osaka, Japan - Panasonic Corporation's today announced that it has achieved the world's highest output temperature coefficient1 at -0.258%/°C2 for mass-produced silicon photovoltaic modules. Up until now, its output temperature coefficient stood at -0.29%/°C. The current efforts yielded a technical improvement of 0.032 points to -0.258%/°C2 at the mass production level, highlighting the positive temperature characteristics of heterojunction solar cells. 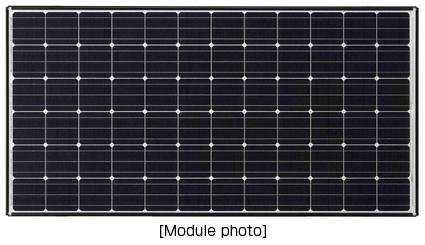 Modules are composed of solar cells, whose conversion efficiency degrades as the temperature rises, thereby reducing the output. The output temperature coefficient indicates the degree of such decline. A general silicon solar cell's output temperature coefficient is -0.50%,3 which denotes a decline of 0.50% in the conversion efficiency as the module temperature rises by 1°C. For instance, at the module temperature anticipated in the summer months (75°C), the conversion efficiency will decrease by 25% in comparison to the environment at 25°C.Panasonic's HIT® modules, which boast an improved output temperature coefficient, will almost halve the decline in the conversion efficiency. 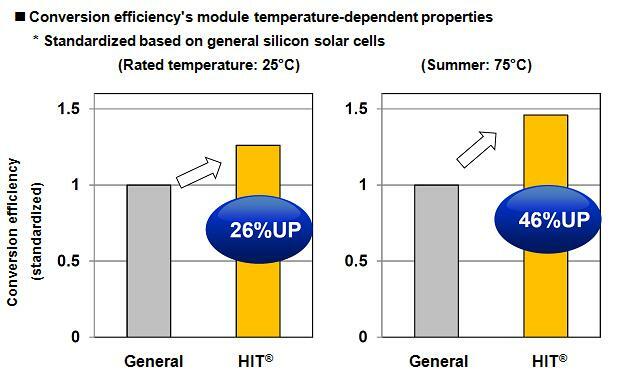 Because the combination of the high conversion efficiency, one of HIT®'s features, and these temperature characteristics will increase the conversion efficiency at 75°C by 46%4 in comparison to general silicon products, Panasonic modules reliably generate power in the summer during which solar cells are known to degrade efficiency. The current results were achieved by further improving Panasonic's unique heterojunction technology,5 the biggest feature of HIT®, and this improved technology has been incorporated in the product. Panasonic will continue to work on technology development and mass commercialization with the aim of achieving higher power generation, and improvements in efficiency and reliability. * HIT is a registered trademark of the Panasonic Group. Technology for junction formation required for solar cells that covers the crystalline silicon base surface with an amorphous silicon layer. This technology has the key feature of superior passivation to compensate for the many flaws around the silicon base surface area. * Calculated based on a conversion efficiency of 15.6% and output temperature coefficient of -0.50%/°C for general silicon solar cells and a conversion efficiency of 19.6% and output temperature coefficient of -0.258%/°C for HIT®.